Infiniti Canada announced pricing today for the 2011 Infiniti QX and it seems they have borrowed a page from last year’s book. Despite boasting improved fuel economy and 25 per cent more power, the 2011 model will carry the same $73,000 MSRP as its predecessor. 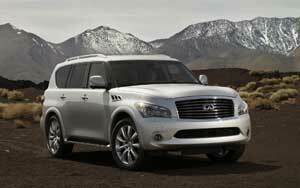 The new QX will hit Canadian showrooms this summer and will be offered in two models, the Infiniti QX56 4WD 7-passenger and the Infiniti QX56 4WD 8-passenger. There is an optional technology package for $8,000. Powering the QX will be a new 5.6-litre V8 engine, combining the responsive acceleration of Infiniti’s VVEL (Variable Valve Event & Lift) technology with the efficiency of Direct Injection Gasoline (DIGÔ) and 7-speed automatic transmission. Horsepower is up 25 per cent from 2010 and 413 lbs-ft of torque allows for a towing capacity of 8,500 lb. Fuel economy has also been bettered by 10 per cent.